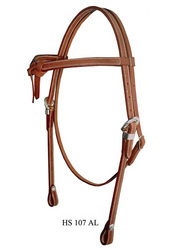 Our customers can avail from us an excellent range of Headstall (HS107AL). Available in different sizes, designs and fittings at pocket friendly rates. Samraat International was established in the year 1988. We are manufacturer, exporter and supplier of Horse Headstalls, Horse Reins, Riding Whips, Horse Saddles, English Reins, Horse Accessories, Show Headstalls, Plain Headstalls, Halters, Horse Bosals, Breast Collars, Horse Riding Clothing etc. We offers all types of high-tech horse products and quality services to all its customers. The stringent quality checks help in delivering premium quality products at competitive prices and opportune time. Here every care and effort is taken to ensure flawless products. We boast a sound infrastructural setup which is equipped with the latest standardized machines and competent workforce to manufacture leather unparalleled products. Our unit is supported by a capacious warehousing facility that is capable of storing huge quantity of products. We regularly improvise on our existing range of products in order to come up with products that are high on performance and durability. We have built our reputation throughout the years from our incredible customer service and the guaranteed product satisfaction. We have done this by committing excellence throughout the company, concentrating on honing our skills and seeking out the most advanced equipment and latest state-of-the art technology. Our reliance on modern production technology has enhanced our ability to guarantee the highest level of precision and quality at competitive prices. Further, contribution of our team of experts has helped us in executing a quality project in the most productive and efficient manner. Our talented team of employees work in sync with our clients to understand their requirements and design cost effective and customized saddlery products.